One of the ways people can judge the popularity of a comic strip is by looking at the licensed products that bear those characters. Well, it used to be a measure of popularity. In the past decade or two, the market has become very fragmented and pop culture itself has become something of a commodity, thus making the presence and expansiveness of licensing deals is difficult to gauge. But before, say, 1990, you could get a sense of a strip's popularity by taking a look at how much licensed product was available. (Calvin & Hobbes being something of an exception.) The Yellow Kid was on tons of materials in the late 1800s and early 1900s and Garfield seemed omnipresent in the 1980s. And, of course, Peanuts has been the champion of licensing for decades now. Charles Schulz's daily strip debuted in 1950. The strip became a rising star quickly, as indicated by the fact that in 1952, Sunday strips were added to the mix and Rinehart published the first Peanuts collection. (Interestingly, Fawcett Publications -- yes, the same people who did Captain Marvel! -- also had a line of collections out beginning in 1962.) 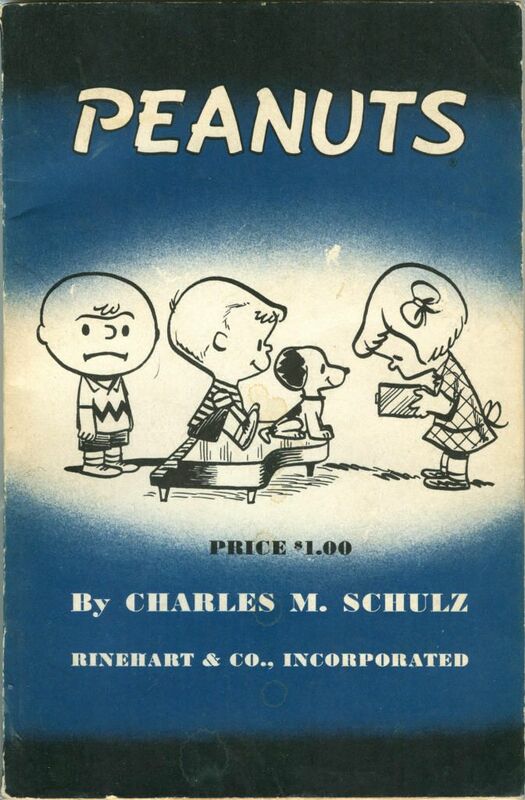 It's popularity grew throughout the decade and in 1958, the first Peanuts toy figures were produced. But then, in 1960, Hallmark got a hold of the license and we've seen a flood of greeting cards, gift wrap, and ornaments ever since! A Snoopy balloon debuted in the Macy's Thanksgiving Parade in 1968, and a Peanuts balloon of some kind has been in every parade since. (Well, according to The Schulz Museum. I can't find any record of Peanuts characters appearing in 1996, '97 or '98.) Snoopy has even led the parade in 1999, 2006 and 2010. Many people probably recall the Dolly Madison ads that accompanied the various Peanuts holiday cartoons. The characters were licensed from at least 1966 through the early 1980s. (The Dolly Madison brand was dropped by Hostess entirely in 2012.) Around the time they were dropped from selling snack cakes, though, MetLife picked up the license and Snoopy has been an integral part of their "Get Met. It Pays." campaign since 1985. You know full well that Peanuts is licensed out the wazoo. I suspect you've known that since you saw A Charlie Brown Christmas for the first time as a kid. But what's striking, I think, is that the popularity has endured for decades. It's been strong enough almost since inception to warrant licensing deal after licensing deal, essentially without a break. Other characters have been popular from time to time, but few have maintained that level of appeal for that long. Fewer still from the realm of comics. Even being quite aware of the Peanuts licensing juggernaut, it's remarkable to realize that MetLife has licensed the property for ads since I was seven years old. Certainly, the campaign does feel like it has been around for most of my life… but it's a bit startling to be reminded of it so explicitly. What lasts for 30 years in marketing and advertising, ever?